Wondering how I naturally obtained this lovely shade of hot pink in my bowl of nice-cream (vegan ice-cream)?? Easy! I owe it all to the cactus pear, also known as the prickly pear. The flesh of a cactus pear, when combined with a banana, will give you this gorgeous magenta hue. This cactus pear nice cream recipe is a healthy dessert that will most definitely make your child excited for a yummy treat that is naturally sweet from nature with no added sugars. 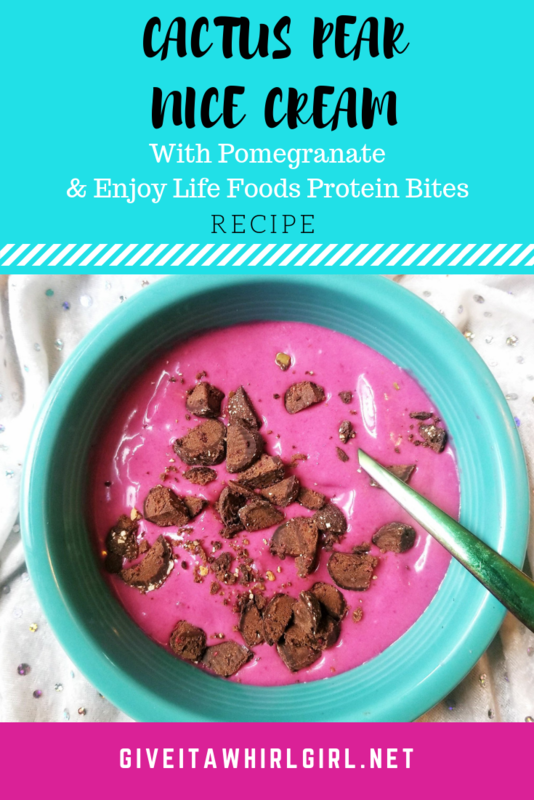 Other ingredients in this frozen treat are frozen pomegranate, two frozen bananas, some coconut milk and Enjoy Life Foods Dark Chocolate Raspberry Protein Bites. This is a much healthier alternative to traditional ice-cream and I always enjoy creating this and serving it at home. Super simple and easy to do too! Nice-cream is the vegan and paleo version of ice-cream. It is dairy-free and lactose-free. Affiliate disclosure: This post contains affiliate links. I receive a commission if items are purchased through these links with no extra cost to you. A good food processor comes in handy for making vegan nice-creams at home. You will also want to prepare in advance for making this by freezing two sliced up bananas overnight. Also, chill a can of full-fat coconut milk in the refrigerator overnight for best results. If you have a can of coconut cream on-hand that makes for even better results, a lot more creamy, but coconut cream is usually around $4 a can and coconut milk works just fine. The Enjoy Life Foods Dark Raspberry Protein Bites were a wise choice here as a nice-cream topping. I chopped them up small and placed them on top. The dark raspberry flavor is actually my favorite flavor of all the Protein Bites and it paired nicely with the flavors of the cactus pear and pomegranate. It also gave this bowl of nice-cream a boost in protein, which is always welcome, especially if you are following a vegan diet. This simple and easy to do gluten-free and vegan nice cream recipe results in the prettiest of pink nice creams you have ever seen. Place the frozen bananas, cactus pear, pomegranate, and chilled coconut in the food processor. Remove cactus pear nice-cream from food processor bowl. To the nice cream with small chunks of Enjoy Life Foods Protein Bites. I used the Dark Raspberry. Cactus Pear & Pomegranate With Enjoy Life Foods Protein Bites Nice-Cream in the food processor. Do not add Protein Bites at this time! I do believe that you will love this hot-pink cactus pear nice cream recipe if you do decide to give it a whirl. It is super unique in its flavor and unlike anything I have ever tried! I am extremely happy with the results of mixing these ingredients together. I was not sure what the outcome would be, but I got brave in the kitchen and I have no regrets! If you are looking for a healthier alternative to ice-cream that is dairy-free and contains no added sugars, you should try making vegan and glutern-free nice creams at home. They are very versatile and you can get creative by whipping them up and experimenting with different ingredients. As a base, I usually use two frozen bananas and make sure I have a can of chilled coconut milk (it must be full-fat and not light coconut milk) on-hand to make this. This will result in approximately 2-3 servings. Most often it is just my daughter and I sharing but sometimes my hubby wants some too. Have you ever tried vegan nice cream? How do you like to create yours? Leave me a comment and let me know. Here are some other posts you will enjoy! Want to find out more about Enjoy Life Foods? This entry was posted in My Cooking Journey, Recipes and tagged banana, cactus pear, coconut milk, dairy free, dark chocolate, enjoy life, enjoy life foods, gluten free, glutenfree, healthy, healthy dessert, healthy food, hot pink, ice cream, lactose free, nice cream, no added sugar, pomegranate, raspberry, recipe, simple, vegan. Bookmark the permalink. Love the color of this ice cream. Like all the natural ingredients you have used, will be making this dish. This is the prettiest nice cream ever!! I LOVE the colour! Gorgeous! I can’t believe this incredible recipe is vegan and gluten-free! I love treats and desserts that are also healthy for you.